If you enjoy bingo then you'll love Bingo Bash! It's an interesting twist to this always-classic game. Each time you play you'll be in a room with up to four other players. Unlike regular Bingo, there isn't a caller to shout out the numbers. 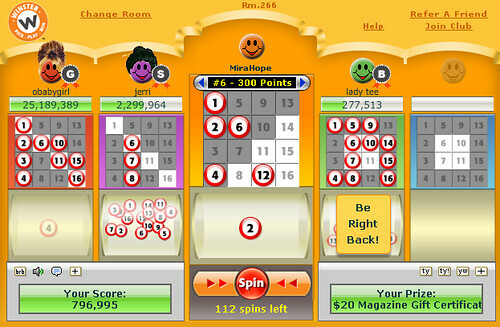 Instead, each person picks their individual numbers by clicking "Spin." (Hitting the Enter key works too!) This is how you get your bingo balls! All of the cards have the numbers 1-16 written on them. The only thing that you can change is the pattern you need to earn a bingo. Each card has a different pattern of numbers shaded grey. Cover all of the grey squares to get a bingo! To change from one card to another, just click the blue arrows at the top of your board. Now the really cool part about Bingo Bash is that you can trade bingo balls with your teammates! Click the bingo ball on your board that you want to trade away and drag it to the bingo ball that you want. Your teammate will see a Yes/No balloon pop up with a picture of the bingo ball that you're offering. If they click "Yes," the bingo balls will switch places! On the other hand, if someone offers you a trade then you'll see a Yes/No balloon pop up with a picture of the bingo ball that they're offering. You don't have to trade if you don't want to, but it's a great way to get quick bingos and make a few friends! If you want to give a bingo ball to a teammate, just drag it to any spot on their board without a bingo ball already on it! The bingo ball will automatically go to the correct spot when the player accepts the trade. Handy! 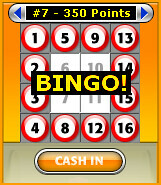 You earn points based on the card that you pick, and there are a total of eight different bingo cards. Even if you have a card finished, you still have to hit "Cash In" to get your bingo. This means that you can flip between cards at any time and you won't lose your bingo balls! Here's what each card is worth. Don't forget that Club Winster members get four times the points! As previously mentioned, to get points you have to hit "Cash In" once your card is completed. Don't be afraid to switch cards. You can't lose your bingo balls! Now, most people stick to cards #7 and #8 because they're worth the most points. 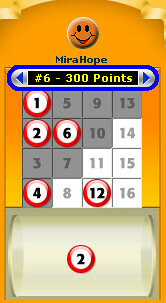 But you should also consider how many points each grey square is worth on each card. To figure this out, take the number of points a card is worth and divide it by the number of grey squares in the pattern. This tells you what one grey square is worth for that particular card. You don't want to bother with that? Oh. Well then check out the table below! All of this means that you get more points per grey square with smaller patterns! Try to finish cards #1 and #2 as often as you can. You'll need to trade so you don't waste spins! 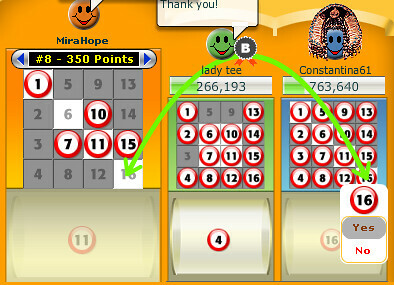 A unique aspect of Bingo Bash (compared to other Winster games) is that you can't draw duplicate pieces. If you already have a 10 bingo ball on your board, then you cannot spin another 10 until you trade it away or start a new card. Really! This means that you should accept EVERY trade. Why? Well since you can't draw a number that's already on your board, accepting bingo balls that you don't need means that you have a better chance of drawing ones that you do need. Let's say that you need one more bingo ball to finish the #4 card, and you have five empty spots. This means that the next time you click "Spin" you have a 1 in 5 chance of getting the bingo ball that you need. One of your teammates is nice and gives you bingo balls 5 and 15, but you still need number 11! It's still a good idea to accept the trades because now you have three empty spots on your board instead of five. This means that when you hit "Spin" you have a 1 in 3 chance of getting bingo ball 11. Those are much better odds and will save you some spins! Before you cash in a bingo, give away every extra (non-pattern) bingo ball that you have. Ideally you will have zero bingo balls left on the white squares! This helps other players complete their cards quicker, and it's just a nice thing to do. ALWAYS say "Thank you!" and "You're welcome!" At Winster we make this very easy to do! Just hit the "ty" or "yw" buttons and you'll say "Thank you!" or "You're Welcome!" You don't even have to type! If you never say "Thank you," you appear ungrateful. Be polite and others will be more inclined to help you out! Alright now! You're ready for Bingo Bash, so get going!